Photo by Tom Doyle. Bench in Winter. 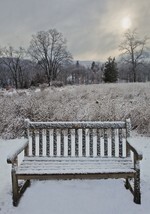 Tom Doyle captured this winter scene with a bench at Kenridge Farm.